The city is trying to "adjust" its $18 billion liability total. (Bloomberg) — Retired Detroit public workers have sent dozens of handwritten letters to the federal judge overseeing the city’s record municipal bankruptcy. In many, the retirees are pleading with the judge to protect their health benefits. The U.S. Bankruptcy Court has posted more than 90 objections to Detroit’s proposed “plan of adjustment.” Each of the objections is one or two pages long. 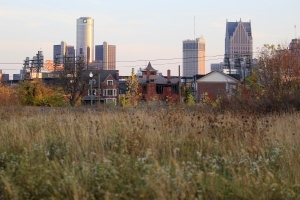 In each, a retiree asks Judge Steven Rhodes to reject Detroit’s proposal. Detroit wants to cut the retirees’ benefits in an effort to reduce an $18 billion mountain of liabilities. Under the proposal by Detroit’s emergency financial manager, Kevyn Orr, general workers would be forced to accept as little as 66 percent of their current pensions while police and firefighters would get at least 90 percent. Retiree health-care benefits would be reduced in part by helping former workers who aren’t yet old enough to qualify for the federal Medicare program to get insurance through the exchanges set up under the Patient Protection and Affordable Care Act (PPACA). A committee appointed to represent former workers in the bankruptcy estimated that about 32,000 current and retired city employees will be affected by the plan. The committee said in a court filing that the proposed cuts would force 20 percent of the more than 23,000 retirees into poverty. Rhodes moved the start of a trial over the debt-cutting plan to July 16 from June 16 after creditors complained that they needed more time to prepare. While it prepares to seek approval of the plan in June or July, the city continues to negotiate with creditors, including bondholders, retirees and union officials. –Editors: Andrew Dunn, Charles Carter.